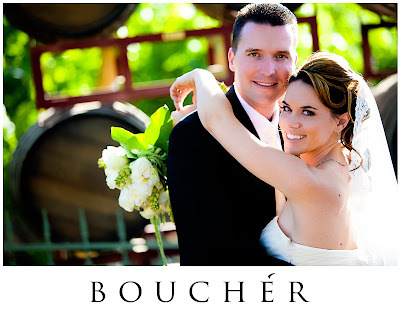 Bouchér Photography: Mrs. Carr is back from her honeymoon! So as most of you know (by our lack of quick responses last week, I wasn't a good fill in for her at all, she is just sooooo darn organized!) that our lovely Studio Manager, Crystal, was out of the office last week. We had the huge honor of shooting her wedding and I truly cannot convey how wonderful and romantic the whole day was. The reception was at Bella Victorian Vineyard, which could easily double as a movie set because I could just see it in a "Father of the Bride" type flick. I will be sure to blog more once they are ready to go. I wanted to thank you for making Crystal's wedding day even more special. Just the one teaser photo so far is gorgeous! I can't wait to see the rest. Crystal is very lucky to have such wonderful bosses/co-workers.